Think of a coffee cupping class similar to the way you would a wine tasting – except with fine coffees, spoons, and slurping! In our coffee cupping, you’ll taste and evaluate some of the finest small batch coffees from regions around the world! Learn about the origins of the coffees you taste, along with the cupping techniques coffee pros use industry wide for evaluation. 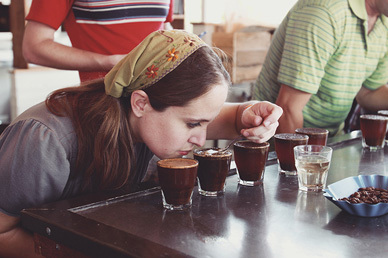 Cupping is very hands-on and open to anyone with an interest in coffee! Typically most in attendance are new to coffee cupping, so don’t worry if you are too! It will be a lot of fun, and you will learn a lot! Attire is casual. Every cupping will feature our newest arrivals of seasonal specialty coffees, so no two classes are ever exactly the same. If you are looking to improve your tasting abilities, or you just want to have a fun experience, come back monthly and taste the best of what’s in season. A Texas Coffee School Coffee Cupping Class gift certificate is a perfect gift for any coffee enthusiast at any interest level! This gift certificate never expires and can be redeemed for one admission to any Texas Coffee School public coffee cupping event! Simply present your gift certificate upon arrival for admission. It’s that easy!